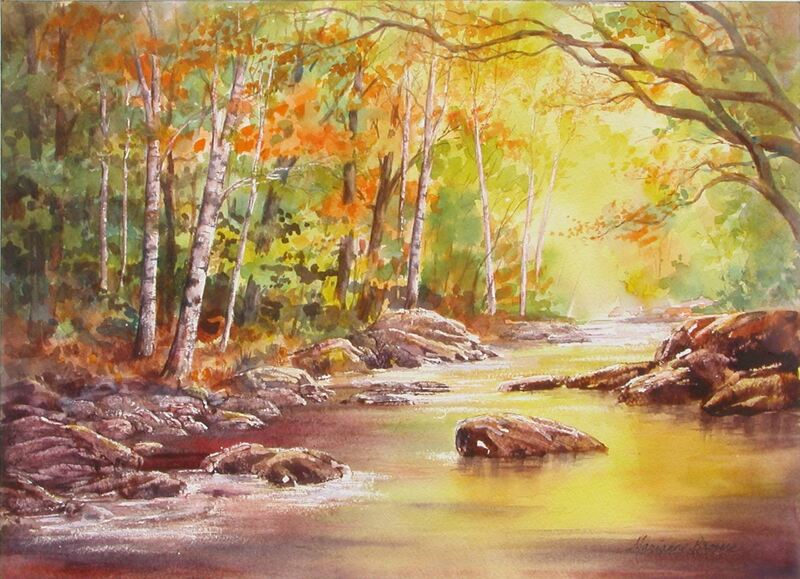 The Barrie Art Club - $WEW: Marianne Broome: Watercolour: Watercolour Landscape with Pzazz! $WEW: Marianne Broome: Watercolour: Watercolour Landscape with Pzazz! A fun, positive approach to painting landscapes in watercolour! Marianne will demonstrate step by step, explaining a range of techniques for achieving an exciting landscape painting from a reference photograph, starting wet-in-wet and exploring the magical properties of this wonderful medium. We will cover composition, values, washes, wet-in-wet, interesting colour choices and simplifying the scene to convey a particular concept. Personal creativity is encouraged and there is lots of individual assistance for all levels. A selection of reference photos will be provided. Marianne was born in England, but spent much of her childhood in Malaysia. The stunning scenery and abundance of exotic animals and plants heightened her love of nature and keen interest in drawing and painting. Marianne settled in Canada in 1980 and lives in Schomberg, surrounded by beautiful countryside. Marianne's art education in England was furthered by courses in Canada. She is a full-time artist and a sought-after art instructor for both acrylics and watercolours. Her stunning paintings of flowers, landscapes and abstracts have been exhibited in many juried exhibitions in which she has received numerous awards, including several “Best in Show”. Her work can be found in private and corporate collections in many countries.